Your learned and wise counsel was crucial to the success we had.... I consider you both true friends and loyal patriots to the true cause of liberty in our Country." instrumental in the favorable outcome that we enjoyed when the Government came after us." "You were there for us when the FTC came after us. Yours is one of the few law firms that really understands the nature of the threat posed to alternative medicine by Big Pharma and its friends in government. You worked very hard for us, showing they really cared for our welfare as well as the issues, and wrote many powerful legal briefs in our defense including an amicus to the Supreme Court. What we will always cherish most is, you prayed with us!" "They always say, 'Don't fight the Fed.' But you did fight them for us and beat them and recovered our attorneys' fees as well. How many other lawyers have done that? Not many. Few have the talent and fewer still the courage." "In the many years since I was court-martialed for disobeying an unlawful order to serve the United Nations under a foreign officer, you have never abandoned me or my cause." 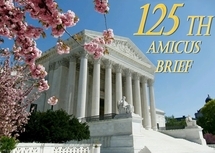 brief were invaluable in obtaining our victory in Heller v. District of Columbia." "Thank you for your eloquent, fearless defense of our country." my Navy benefits allowing me to serve God and provide for my family"
"May God bless your tireless efforts on behalf of freedom-loving people everywhere"
you are doing outstanding work. I offer my strong congratulations." "Paul and I can’t thank you enough for your excellent and successful work as part of our federal criminal defense team. Your firm’s technical legal challenges to the indictment no doubt forced the government to reconsider its case and drop six of the eight counts against us. And Rob’s four trips to Houston, courtesy of Gun Owners of America, helped us get ready for trial. Your firm’s knowledge and experience with federal gun law was invaluable, and eventually the jury acquitted us of the two remaining charges against us. When the judge read the “not guilty” verdicts, it was a wonderful day for us all." "I have worked with your firm on firearms cases for more than a decade, and it is always a pleasure. Most recently, your work was very helpful to me in my role as defense counsel in a federal criminal trial. Your firm’s extensive work with federal gun laws helped fashion some creative arguments that really helped us win the case." (former Assistant Director for Criminal Enforcement, BATF). "Your amicus work is outstanding, and I strongly congratulate you. Rather often wonder if there is any law left these days. Your briefs encourage me to believe there is, and I hope you can often continue with them." Representing Public Service Research Council, this brief urges the Supreme Court to uphold President Reagan’s firing of air traffic controllers engaged in illegal strike activity. Today, the U.S. Court of Appeals for the District of Columbia gave us a victory in our challenge to Postal Service pricing which discriminated against nonprofit mailers. Bill Olson co-authored an article entitled “Critical Issues Ahead for Non-Profit Mailers” with economist Dr. John Haldi for Fund Raising Management, February 1981. Bill Olson received a memorandum from President-Elect Reagan thanking him for the submission of the Final Report of the Transition Team for the Legal Service Corporation which Bill chaired.